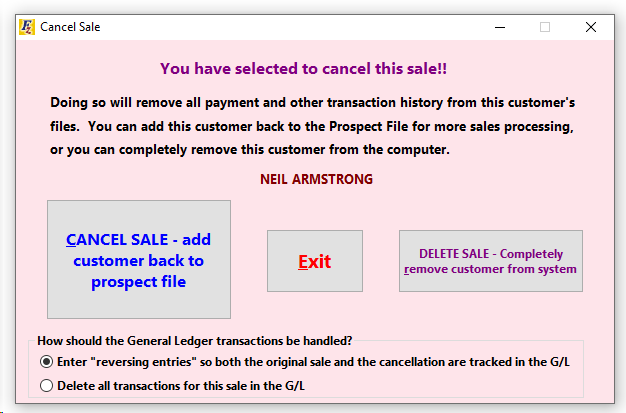 The button the left will undo the customer's deal and move them back to the prospect file. If the customer was added through the "Pre-Existing" or "Purchased" customer screen, the customer's deal will be returned to that screen. The button on the right deletes the sale from the system FOREVER. The vehicle associated with the sale is returned to the inventory file. It may be deleted from the inventory file. The bottom of the screen gives the option either to reverse the general ledger transactions or delete them FOREVER from the system. The option only appears if it has been more than 30 days since the sale date. If it has been less than 30 days the general ledger transactions are automatically deleted FOREVER.